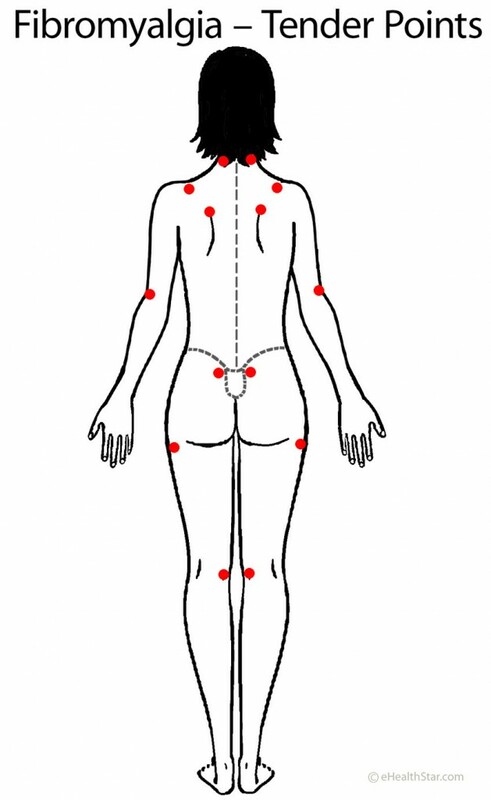 The only sign typical for fibromyalgia a doctor can identify during a physical examination are symmetrical tender points on both sides of the body and above and below the waist . Tender point locations include the base of the skull at the back of the neck, the sides of the base of the neck, the upper (medial) angle of the scapula, the front of the neck above the clavicles, the joints between the 2nd ribs and the sternum, the outer (lateral) side of the elbows, the upper outer buttocks, the hips, and the inner (medial) sides of the knees (Picture 1) [10,11]. Tender points may be absent, especially at the onset of fibromyalgia, and their number can change considerably through time.